William F. Milliken - Milliken Research Associates Inc. Written for the engineer as well as the race car enthusiast, Race Car Vehicle Dynamics includes much information that is not available in any other vehicle dynamics text. 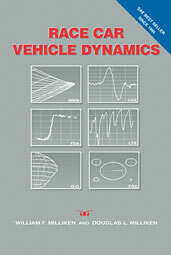 Truly comprehensive in its coverage of the fundamental concepts of vehicle dynamics and their application in a racing environment, this book has become the definitive reference on this topic. Although the primary focus is on the race car, the engineering fundamentals detailed are also applicable to passenger car design and engineering. Authors Bill and Doug Milliken have developed many of the original vehicle dynamics theories and principles covered in this book, including the Moment Method, "g-g" Diagram, pair analysis, lap time simulation, and tire data normalization. The book also includes contributions from other experts in the field. Also available is the companion workbook Race Car Vehicle Dynamics - Problems, Answers and Experiments. Buy both as a set and save! If you do not have access to SAE MOBILUS via username/password or institutional access, you can still purchase the Book, Race Car Vehicle Dynamics.